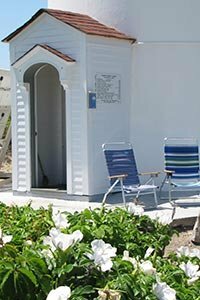 The Cape Cod Chapter of the American Lighthouse Foundation is a non-profit organization made up of volunteer members, whose mission is the restoration and preservation of Race Point Lighthouse, the Keeper's House, the Whistle House, the Oil House, and Wood End and Long Point Lighthouses. The Chapter seeks to ensure that the public and future generations will have reasonable and safe access to these historical structures and sites. The Chapter will provide educational programs and materials to increase the public's awareness of the historical importance of the Race Point, Wood End and Long Point Lighthouses. As early as 1808, Provincetown’s residents asked for a lighthouse at Race Point. Travel was treacherous for vessels negotiating the bars near Race Point at Cape Cod’s northern tip. Race Point Lighthouse was first lighted on November 5, 1816. The rubblestone tower’s light was 25 feet above sea level, and was one of the earliest revolving lights - in an attempt to differentiate it from other lighthouses on Cape Cod. In 1840, the Keeper’s house was built. In 1852 a fog bell was installed at Race Point. Three years later, a fourth order Fresnel lens was installed in the tower. In 1873, the bell was replaced by a steam-driven fog signal housed in a new building. A second Keeper’s dwelling was built in 1876. By 1876, the old stone “tower” needed rebuilding, and was replaced by a 45-foot cast-iron lighthouse, lined with brick. The Fresnel lens was also installed. The original Keeper’s house was torn down, and a new dwelling built. A water cistern was added in 1877. Three Keepers and their families lived at the lighthouse in the two separate Keeper’s houses. The children walked almost three miles over sand to school every day. In the 1930’s a Keeper named James Hinckley made the trip much quicker by customizing a Ford into a dune buggy; the trip now took just thirty minutes. We now use a newer form of dune buggy - a Suburban! In 1957, Race Point Light was electrified. Three years later the 1874-Gothic Revival Keeper’s house was torn down, and the other house modernized. The light was automated in 1972. The Fresnel lens was replaced by a 190mm optic, and in 1994 the beacon and fog signal became solar-powered. The Keeper’s house remained boarded up for more than 20 years after the Coast Guard left and in 2003 became solar powered as well. In 2007 a wind turbine was added. In 1995, the Keeper’s house and surrounding property was leased to the New England Lighthouse Foundation. Known for their work on other New England Lighthouses, International Chimney rebuilt the roof and chimney of the Keeper’s house. Master craftsmanRichard Davidson of Onset rebuilt much of the interior and exterior. Dana Green, of Green and Robinson, crafted the windows and doors for the lighthouse and Whistle house. Volunteers finished renovations, and the four-bedroom Keeper’s house opened for overnight stays. Jim Walker, former president of the Cape Cod Chapter of the American Lighthouse Foundation, reported a curious mystery in 1996. An American flag appeared on a temporary flag pole, put there by an unknown benefactor. After a bad storm, the flag was shredded; again, a new flag mysteriously took its place. The flag is now flown throughout the season, greeting guests from around the world as they arrive at Race Point. Today, the Race Point LightHouse optic is still an active aid to navigation, maintained by the Coast Guard. The Cape Cod Chapter of the American Lighthouse Foundation maintains all of the structures and grounds.